Over the past few weeks, I've been working with my coach, Reba Riley (connect with her here! ), to combat my phone overuse issue. (Read more about that in Are You Addicted to Your Phone?, Strategies for Phone Overuse (and Other Struggles), and Find Your WHYPower: Inspiration for Breaking Bad Habits) Overall, I've made some pretty great progress. As with all habit-breaking ventures, there have been good days and bad, tactics that have worked and those that haven't been as successful, but I certainly have a much different relationship with my phone than I did a few weeks back. The other day I was thinking about how, more often than not, people talk a lot about the beginning (the realization of the need for change and the plan they want to enact to transform) and about the result (how well they did or didn't do with that plan), but the middle bit — which is usually slow and steady progress that doesn't always have the flair of the exciting launch or the successful landing — doesn't get as much attention. And usually that's where the good stuff is actually happening! When Reba and I decided to make my next goal to stay where I am for now, to keep doing what's worked for me rather than adding new strategies, it seemed like a good time to reflect on what's been working for me in terms of making positive progress. Here are the top four things that have helped me over the past few weeks as I've been working on this phone issue. Asking for help isn't one of my strengths. I'm much more of a go-it-alone kinda girl, but this has probably been the biggest game-changer for me in terms of making positive progress with my phone. Could I have make progress alone? Possibly. But I definitely have with the help of Reba. Having a perspective that's different from the one in your own head can be eye-opening and insightful. Having someone to talk to allows you to explore ideas in new ways. I can write all day about what I'm experiencing, but the second I share it with someone else, I'm opening myself up to new ideas and new ways of thinking about my own ideas. Asking for help can be hard if it's not your thing, but it's proven, for me at least, to be one of the best ways to make positive progress tackling a problem that I wasn't solving very well all on my own. As I've been working through this phone situation, I've had some ups and downs. Anyone who has tried to break a bad habit (or tackle an addiction) knows that progress is never linear. There are good moments and bad ones. With the help of Reba, I've been able to be much less judgmental of the "bad" moments. It might seem like a small thing, but the simple choice not to judge myself for spending too much time scrolling has made a huge difference. This is particularly true because I have a rebellious (and sometimes self-destructive) nature, so if I think something is "bad," it becomes more alluring to me. When I stopped thinking of certain behaviors as bad, they became less enticing, and I found that I spent less time engaging in them. Before working with Reba, I was beating myself up every time I spent too much time on my phone. I felt out of control and frustrated with myself and that led me back to making bad choices. (If I was already failing, why not just keep going?, I thought.) As you can imagine, this wasn't a very helpful mindset, and I didn't make much progress at all. In addition to helping me embrace the imperfections, the non-linearness of progress, Reba also helped remind me of one of the key elements of Positively Present: self-love. Being kind to yourself isn't just about being encouraging or celebrating the wins (though those things are important too!). It's also about being kind to yourself when you backslide on progress, when you have a day that isn't as positive as it could have been. This might not seem like the most action-oriented method for making progress, but it's honestly made a huge difference for me. Another great progress-making tip I've explored with Reba over the past few weeks is trying new tactics. At one point, I tried to keep my phone out of my bed so I wouldn't spend time scrolling before falling asleep. For one glorious night, I put it in a box on my dresser and didn't look at it until morning. The next day, it was back in my bed, and it hasn't seen the inside of the box since. My first instinct was to feel terrible about this, but then I asked myself, What would Reba say?, and my perspective changed instantly. (If you don't have a Reba, you can imagine what a friend would say or what you'd say to a friend 'cause it's usually way kinder than what we say to ourselves.) As soon as I thought about it from that point of view, I was more accepting of myself (I wasn't yet ready for that step or maybe that wasn't the right strategy for me.) and I considered if something else might work. Rather than removing the phone from my bed, I considered where I spent the most time scrolling and deleted the apps instead. It made a huge difference. Without Twitter and Pinterest on my phone (two of the worst scrolling temptresses), I wasn't as tempted to scroll in bed. Yes, I still have some things to work on, but trying a new tactic, rather than beating myself up when the first one I tried didn't work, was essential for positive progress! These four tactics have been incredibly useful for me, but different strategies work for different people.What works well for me might not work well for you when it comes to making progress (particularly if you're working to break a different habit or behavior). While I think what's helped me the most is having someone to talk about my progress with (thanks, Reba! ), if you don't have a coach, you can still spend time thinking about what's worked for you in the past to identify four tactics that'll work for you. Reba and I came up with a progress worksheet you can download and fill out with your own tactics for progress. (You can also cut them out and put them up somewhere you might need a reminder!) If you're not sure how to figure out what works for you, consider a habit you've broken in the past and what strategies were most helpful to making progress. If you can't think of one of those, reflect on something you do well — a positive habit you do daily, maybe something you don't even think about, like brushing your teeth — and consider how you integrate that behavior into your life. Download the Progress Worksheet here! As I've been thinking about this over the past few days, I've been reminded of just how vital it is to reflect on your progress, to know what's working well for you so you can keep doing it (and keep it in mind for the future too!). Maintaining momentum is challenging — no matter what you're working on! — and reflecting on what works for you can keep you motivated to keep going. Every Day Matters 2019 Diary! Tomorrow the Every Day Matters 2019 Diary is officially on sale! Yes, 2019 might feel far away now, but the days fly by quickly and, since the diary has sold out in previous years, I wanted to make sure you had a chance to check it out before it does! The 2019 edition is the fifth (!!!!) one I've created, and it's, in my opinion, the best one yet. As with previous versions, this diary/planner features 12 monthly themes, 52 inspiring quotes, and 52 corresponding activities to help you take action on the inspiration in real life. The 2019 monthly themes are: Mindfulness, Wonder, Creativity, Vision, Bravery, Positivity, Purpose, Truth, Acceptance, Empowerment, Joyfulness, and Resilience. Each theme is explored in detail through motivating affirmations, relevant quotes, engaging activities, and provocative questions that I've chosen specifically to help you feel engaged and inspired throughout the year. For the past few years, I've created a video where I flip through the diary and talk a bit about the layout and themes. Because planners are such personal things, I always find it helpful to see what they look like when choosing one, and I hope the video helps you get a feel for the style and layout. This year's video is a little bit different, but it allows you to get a better look at the pages, so I really hope you enjoy it! 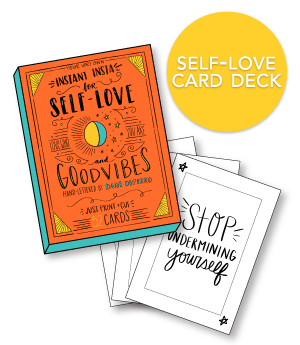 When creating the illustrations and writing the content for the diary each year, my goal is to help you cultivate more positivity, awareness, and self-love throughout the year. Each year I use the diary too, and, even though I am the one to create it, I always find that it inspires me to come across new insights and gives me an opportunity to do a little bit of self-care on a daily basis. If you use the diary throughout the year, I bet you'll find yourself empowered and informed by the words of wisdom, the weekly activities, and the makes-you-think questions. And, perhaps the greatest thing about the diary is that it'll inspire you to explore the topics in the real word, with activities and prompts that get the ideas off the page and into your daily life! So many of us spend so much time online (in my case, way too much time!) that having a tangible diary in which you track activities (or, as I often do, write down all that you're thankful for) can have such a positive impact on your wellbeing. If you purchase a copy, I hope you love using it as much as I love creating it. Have any questions about the content, layout, or where to purchase a copy in your country? Leave a comment below and I'll reply as soon as I can! You might recall that, a few weeks ago, I wrote about phone addiction. Shortly after I wrote that post, my friend Reba Riley offered to help me work on it! As Reba and I work through this, I'll be sharing some guest posts from her here, featuring her wisdom and insights, so you can learn along with me. Check out the last post Reba wrote, Strategies for Phone Overuse (and Other Struggles), and stay tuned for more strategies, info, and (hopefully!) progress as Reba and I work together on this! Check out the paragraph below this post for my thoughts on the great strategies Reba has suggested for me. In the last post, we talked about recognizing the courage it take to ask for help, and lowering our expectations to create small, doable steps of positive change. Dani’s first assignments were to practice self-love by “putting down the whip” of mental judgment and giving herself permission (including an official permission slip!) to pay attention to her actions, emotions, and triggers around phone overuse—without judging herself. I reminded Dani Progress > Perfection, always. Recovery of any kind never goes in a straight line up. It zigs and zags forward and back—the most important thing is traction in the right direction. For the rest of us mere mortals, willpower is strongest in the morning and at the beginning of the week, and gets progressively weaker as the day and week wear us down. Willpower is also affected by mood, stress, fatigue—the list is endless. Basically, willpower is the unreliable friend we can’t count on. Sometimes it shows up, sometimes it doesn’t, which means it alone is not enough to create lasting change. Fortunately, we have access to something much better than willpower: WHYpower. WHYpower is what happens when our WHY to change becomes bigger than our why to stay as we are. Anyway. I stumbled over WHYpower out of necessity: I knew I needed to tell my story, but I also knew willpower would not sustain me. So I plopped on the couch with my journal, and I asked myself: “WHY?” Why do I want to do this impossible thing? The reason I came up with was so strong I can still close my eyes and feel it: For everyone who hurts like I did. I imagined I could reach forward in time and put my arms around a reader who needed to hear my story, who needed to know s/he was not alone. That was my WHYpower. Every time I wanted to quit I thought about that person who needed me. Now, not every WHY will be this dramatic, but my story illustrates a larger point. You can accomplish anything if your WHY is big enough. HOW will this change affect your life (or the lives of others)? YOUR ultimate goal is what? Our amazing Dani created a TransforMotion worksheet you can use to find your WHYpower. Once you have it, use your WHY to silence all your doubts and fears, and pull it out when willpower fails. Once your WHYpower is in place, you can create new goals (still small, still achieveable, but slightly more challenging). Change Morning and Evening Routines. Dani identified going to bed and waking up as her top triggers for scrolling on her phone. So we came up with a plan to help her change her am and pm routine to circumvent the habit. Barrier method: Put phone in a box out of reach from the bed. Previously, Dani watched Netflix on her phone in bed before sleeping—which meant easy access to scrolling. Then she would reach for it first thing in the morning. To change this, we decided she would watch Netflix on another device, try a noise machine, and keep a book beside her bed. Substitute Task: Since she usually gets up with the phone, Dani said she would try to have breakfast and take out Barkley before getting the phone out of its box. Try is key; remember Progress > Perfection! Look For Patterns and Be Willing to Be Uncomfortable. To make more changes like the ones above, Dani needs to continue paying attention to the when, where, why, and how of her phone use. We will use that information to create goals for next week. When Dani finds a trigger or pattern, she needs to pause and be willing to sit with the discomfort of not picking up her phone, if only for a few minutes. Being willing to be uncomfortable (which she definitely will be in the morning and at night), is key to eliminating negative behaviors. We are all rooting for you, Dani! Keep up the great work! I'm so thankful for Reba's help. (To connect with Reba about speaking or coaching, email her at connect@rebariley.com!) Week #1 was so amazing, and I never would have taken such positive action on my own. By paying attention whenever I picked up the phone, I learned so much about my habit (and that information has been so essential to continuing to tackle this problem). Week #1 had me feeling like a rockstar, taking note of what I was doing and doing my best not to judge myself whenever spent too much time scrolling. I went into Week #2 feeling empowered and encouraged. Breaking habits is so difficult and it's been so helpful to have Reba's insights and encouragement as I work on this. If you're struggling with phone overuse (or any other bad habit! ), I hope these posts are helping you make positive progress!